Attorney General Loretta E. Lynch and Deputy Attorney General Sally Q. Yates released the following statements today on the passing of Associate Deputy Attorney General David Margolis, senior-most career employee at the Department of Justice. I am sure Mr. Margolis was a kind, personable and decent chap to those who knew and worked with him. I can be sure because there have been many voices I know who have related exactly that. He was undoubtedly a good family man and pillar of his community. None of that is hard to believe, indeed, it is easy to believe. Sally Yates is spot on when she says Margolis’ “dedication to our [DOJ] mission knew no bounds”. That is not necessarily in a good way though, and Margolis was far from the the “personification of all that is good about the Department of Justice”. Mr. Margolis may have been such internally at the Department, but it is far less than clear he is really all that to the public and citizenry the Department is designed to serve. Indeed there is a pretty long record Mr. Margolis consistently not only frustrated accountability for DOJ malfeasance, but was the hand which guided and ingrained the craven protection of any and all DOJ attorneys for accountability, no matter how deeply they defiled the arc of justice. Second, the current limitation on the DOJ OIG’s jurisdiction prevents the OIG – which by statute operates independent of the agency – from investigating an entire class of misconduct allegations involving DOJ attorneys’ actions, and instead assigns this responsibility to OPR, which is not statutorily independent and reports directly to the Attorney General and the Deputy Attorney General. In effect, the limitation on the OIG’s jurisdiction creates a conflict of interest and contravenes the rationale for establishing independent Inspectors General throughout the government. It also permits an Attorney General to assign an investigation raising questions about his conduct or the conduct of his senior staff to OPR, an entity reporting to and supervised by the Attorney General and Deputy Attorney General and lacking the insulation and independence guaranteed by the IG Act. This concern is not merely hypothetical. Recently, the Attorney General directed OPR to investigate aspects of the removal of U.S. Attorneys. In essence, the Attorney General assigned OPR – an entity that does not have statutory independence and reports directly to the Deputy Attorney General and Attorney General – to investigate a matter involving the Attorney General’s and the Deputy Attorney General’s conduct. The IG Act created OIGs to avoid this type of conflict of interest. It created statutorily independent offices to investigate allegations of misconduct throughout the entire agency, including actions of agency leaders. All other federal agencies operate this way, and the DOJ should also. Third, while the OIG operates transparently, OPR does not. The OIG publicly releases its reports on matters of public interest, with the facts and analysis underlying our conclusions available for review. In contrast, OPR operates in secret. Its reports, even when they examine matters of significant public interest, are not publicly released. Said fact and heinous lack of accountability for Justice Department attorneys, not just in Washington, but across the country and territories, is largely because of, and jealously ingrained by, David Margolis. What Glen Fine was testifying about is the fact there is no independent regulation and accountability for DOJ attorneys. They are generally excluded from the Department IG purview of authority, and it is rare, if ever, courts or state bar authorities will formally review DOJ attorneys without going throughout the filter of the OPR – the Office of Professional Responsibility – within the Department. A protection racket designed and jealously guarded for decades by David Margolis. Even when cases were found egregious enough to be referred out of OPR, they went to…..David Margolis. If you want a solid history of OPR, and the malfeasance it and Margolis have cravenly protected going back well over a decade, please go read “The Roach Motel”, a 2009 article in no less an authority than the American Bar Association Journal. It is a stunning and damning report. It is hard to describe just how much this one man, David Margolis, has frustrated public transparency and accountability into the Justice Department that supposedly works for the citizens of the United States. It is astounding really. The analogy calls to mind the character of Winston Wolfe, played by Harvey Keitel in the 1994 film “Pulp Fiction.” In the movie, Wolfe is called in by mob honchos to dispose of the evidence after two foot soldiers accidentally kill a murder witness in the back of their car. 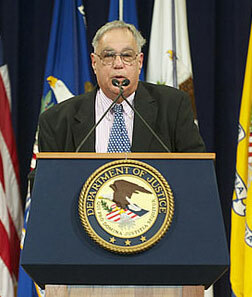 “The Cleaner” Mr. Margolis considered himself, while fastidiously sanitizing gross malfeasance and misconduct by DOJ attorneys, all the while denying the American public the disinfectant of sunshine and transparency they deserve from their public servants (good discussion by Marcy, also from 2010). Perhaps no single incident epitomized Margolis’ determination to be the “cleaner” for the Department of Justice and keep their dirt from public scrutiny and accountability than the case of John Yoo (and to similar extent, now lifetime federal judge Jay Bybee). Yoo as you may recall was the enlightened American who formally opinedcrushing innocent children’s testicles would be acceptable conduct for the United States to engage in. Yoo and Bybee, by their gross adoption of torture, literally personally soiled the reputation of the United States as detrimentally as any men in history. So, what did David Margolis do in response to the heinous legal banality of evil John Yoo and Jay Bybee engendered in our name? Margolis cleaned it up. He sanitized it. Rationalized it. Ratified it. Hid it. To such an extent architects of such heinous war crimes are now lifetime appointed federal judges and tenured professors. Because that is what “The Cleaner” David Margolis did. “Protecting” the DOJ from accountability, at all costs, even from crimes against humanity, was simply the life goal of David Margolis, and he was depressingly successful at it. So, less than 24 hours in to the passing of The Cleaner, is it too early to engage in this criticism? Clearly other career officials at the DOJ think discussing the pernicious effects of Margolis on accountability and transparency are out of bounds. Having laid out the above bill of particulars as to David Margolis, I’d like to return to where we started. As I said in the intro, “I am sure Mr. Margolis was a kind, personable and decent chap”. That was not cheap rhetoric, from all I can discern, both from reading accounts and talking to people who knew Mr. Margolis well, he was exactly that. Ellen Nakashima did a fantastic review of Margolis in the Washington Post last year. And, let’s be honest, the man she described is a guy you would love to know, work with and be around. I know I would. David Margolis was a man dedicated. And an incredibly significant man, even if few in the public understood it. Say what you will, but Mr. Margolis was truly a giant. While I have no issue delineating what appear to be quite pernicious effects of David Margolis’ gargantuan footprint on the lack of accountability of the Department of Justice to the American citizenry, I have some real abiding respect for what, and who, he was as a man. Seriously, read the Nakashima article and tell me David Margolis is not a man you would love to kill some serious beers with by a peaceful lake somewhere. Focus instead on the institution, not the players. The players are just data points, hopefully leading to greater understanding of the institutional realities. Those words were literally the first I thought of yesterday when I received the phone call David Margolis had passed. They are true and important words that I, and all, need to take heed of more frequently. David Margolis, it turns out from all appearances and reports, was a complex man. Clearly great, and clearly detrimental, edges to him. So what will his legacy be at the Department of Justice? Will the closing of the Margolis era, and it was truly that, finally bring the institution of the Department into a modern and appropriate light of transparency, accountability and sunshine? Or will the dirty deeds of David Margolis’ historical ratification and concealment of pervasive and gross misconduct by Department of Justice attorneys become permanently enshrined as a living legacy to the man? The NYT has a story that solves a question some of us have long been asking: Which company challenged a Protect America Act order in 2007, only to lose at the district and circuit level? But the NYT doesn’t explain something that Russ Feingold pointed out when the FISA Court of Review opinion was made public in 2009 (and therefore after implementation of FISA Amendments Act): the government didn’t (and still didn’t, under the PAA’s successor, the FISA Amendments Act, Feingold seems to suggests) give Yahoo some of the most important information it needed to challenge the constitutionality of the program. This post — which again, applies to PAA, though seems to be valid for the way the government has conducted FAA — explains why. The court’s ruling makes it clear that PAA (and by association, FAA) by itself is not Constitutional. By itself, a PAA or FAA order lacks both probable cause and particularity. The programs get probable cause from Executive Order 12333 (the one that John Yoo has been known to change without notice), from an Attorney General assertion that he has probable cause that the target of his surveillance is associated with a foreign power. And the programs get particularity (which is mandated from a prior decision from the court, possibly the 2002 one on information sharing) from a set of procedures (the descriptor was redacted in the unsealed opinion, but particularly given what Feingold said, it’s likely these are the minimization procedures both PAA and FAA required the government to attest to) that give it particularity. The court decision makes it clear the government only submitted those — even in this case, even to a secret court — ex parte. The petitioner’s arguments about particularity and prior judicial review are defeated by the way in which the statute has been applied. When combined with the PAA’s other protections, the [redacted] procedures and the procedures incorporated through the Executive Order are constitutionally sufficient compensation for any encroachments. The [redacted] procedures [redacted] are delineated in an ex parte appendix filed by the government. They also are described, albeit with greater generality, in the government’s brief. [redacted] Although the PAA itself does not mandate a showing of particularity, see 50 USC 1805b(b), this pre-surveillance procedure strikes us as analogous to and in conformity with the particularity showing contemplated by Sealed Case. In other words, even the court ruling makes it clear that Yahoo saw only generalized descriptions of these procedures that were critical to its finding the order itself (but not the PAA in isolation from them) was constitutional. Incidentally, while Feingold suggests the company (Yahoo) had to rely on the government’s good faith, to a significant extent, so does the court. During both the PAA and FAA battles, the government successfully fought efforts to give the FISA Court authority to review the implementation of minimization procedures. The NYT story suggests that the ruling which found the program violated the Fourth Amendment pertained to FAA. Last year, the FISA court said the minimization rules were unconstitutional, and on Wednesday, ruled that it had no objection to sharing that opinion publicly. It is now up to a federal court. I’m not positive that applies to FAA, as distinct from the 215 dragnet or the two working in tandem. But other reporting on PRISM has made one thing clear: the providers are still operating in the dark. The WaPo reported from an Inspector General’s report (I wonder whether this is the one that was held up until after FAA renewal last year?) that they don’t even have visibility into individual queries, much less what happens to the data once the government has obtained it. But because the program is so highly classified, only a few people at most at each company would legally be allowed to know about PRISM, let alone the details of its operations. This gets to the heart of the reason why Administration claims that “the Courts” have approved this program are false. In a signature case where an Internet provider challenged it — which ultimately led the other providers to concede they would have to comply — the government withheld some of the most important information pertaining to constitutionality from the plaintiff. The government likes to claim this is constitutional, but that legal claim has always relied on preventing the providers and, to some extent, the FISA Court itself from seeing everything it was doing. House Judiciary Committee Chairman Lamar Smith, R-Texas, told President Obama Thursday he’d like to interview seven current and former administration officials who may know something about a spate of national security leaks. The administration officials include National Security Advisor Thomas Donilon, Director of National Intelligence James Clapper, former White House Chief of Staff Bill Daley, Assistant to the President for Homeland Security and Counterterrorism John Brennan, Deputy National Security Advisor Denis McDonough, Director for Counterterrorism Audrey Tomason and National Security Advisor to the Vice President Antony Blinken. Of course the effort is sure to be futile–if Smith’s goal is to figure out who leaked to the media (though it’ll serve its purpose of creating a political shitstorm just fine)–for two reasons. First, only Clapper serves in a role that Congress has an unquestioned authority to subpoena (and even there, I can see the Intelligence Committees getting snippy about their turf–it’s their job to provide impotent oversight over intelligence, not the Judiciary Committees). A pity Republicans made such a stink over the HJC subpoenaing Karl Rove and David Addington and backed Bush’s efforts to prevent Condi Rice from testifying, huh? The other problem is that Smith’s list, by design, won’t reveal who leaked the stories he’s investigating. He says he wants to investigate 7 leaks. Smith said the committee intends to focus on seven national security leaks to the media. They include information about the Iran-targeted Stuxnet and Flame virus attacks, the administration’s targeted killings of terrorism suspects and the raid which killed Usama bin Laden. Smith wants to know how details about the operations of SEAL Team Six, which executed the bin Laden raid in Pakistan, wound up in the hands of film producers making a film for the president’s re-election. Also on the docket is the identity of the doctor who performed DNA tests which helped lead the U.S. to bin Laden’s hideout. But his list doesn’t include everyone who is a likely or even certain leaker. Take StuxNet and Flame. Not only has Smith forgotten about the programmers (alleged to be Israeli) who let StuxNet into the wild in the first place–once that happened, everything else was confirmation of things David Sanger and security researchers were able to come up with on their own–but he doesn’t ask to speak to the Israeli spooks demanding more credit for the virus. Siobhan Gorman reports that the secret program that Leon Panetta just revealed to Congress is an assassination squad. A secret Central Intelligence Agency initiative terminated by Director Leon Panetta was an attempt to carry out a 2001 presidential authorization to capture or kill al Qaeda operatives, according to former intelligence officials familiar with the matter. The precise nature of the highly classified effort isn’t clear, and the CIA won’t comment on its substance. According to current and former government officials, the agency spent money on planning and possibly some training. It was acting on a 2001 presidential legal pronouncement, known as a finding, which authorized the CIA to pursue such efforts. The initiative hadn’t become fully operational at the time Mr. Panetta ended it. In 2001, the CIA also examined the subject of targeted assassinations of al Qaeda leaders, according to three former intelligence officials. It appears that those discussions tapered off within six months. It isn’t clear whether they were an early part of the CIA initiative that Mr. Panetta stopped. First, there must be something more. Aside from the near ubiquitous drone strikes, which seem to be fully acknowledged and non-controversial, there have been enough personal strikes against al Qaeda figures that appear likely to have been assassinations, that for all intents and purposes, it appears we are assassinating al Qaeda figures. It may be, for example, that the conflict reported by Sy Hersh is the problem–that Special Ops has the mandate to kill but CIA is being dragged into those assassinations. Apparently, Greg Craig (who IMHO thus far is batting about 0-3 in his tenure as White House Counsel, counting his erroneous response on FISA, his juvenile cover-up of Rahm’s calls, and his response to the botched Oath) believes in Pixie Dust. Note Craig said this in response to a question–presumably from one of the Senators. As a reminder, both Sheldon Whitehouse and Russ Feingold sit on the SSCI. They’re the two guys trying to legislate away this kind of Pixie Dust, the claim that the President can just ignore his own executive orders. Whitehouse, of course, is the guy who first pointed out the way Bush had used Pixie Dust to wish away Saint Ronnie’s prohibitions on spying on Americans. And Whitehouse asked this very question of Michael Mukasey before he was confirmed, only to have Mukasey flip-flop on it as Attorney General. So I’m guessing that the question, at least, was asked by Whitehouse with Feingold the second most probable. Someone ought to tell Mr. Greg "0-4" Craig, though, that once you espouse Pixie Dust you’ve lost all credibility to claim your remarks were "mischaracterized." Pixie Dust, as I’ve explained it, is the process by which the Bush White House has relied upon an OLC opinion stating that the President doesn’t have to rewrite his Executive Orders before he violates it. If he acts contrary to an Executive Order, that constitutes "modifying" the order, even if he never publicly changes the order. Hell, apparently in this White House, the VP could make up his own interpretations of Executive Orders, even if the White House Counsel told him he was wrong. Sheldon Whitehouse and Russ Feingold think that whole concept is as ridiculous as we think it is–and they’ve just sponsored a bill to end the practice. U.S. Senators Russ Feingold (D-WI) and Sheldon Whitehouse (D-RI) have introduced legislation to prohibit the President from relying on one form of “secret law.” The Feingold-Whitehouse bill would require public notice when the President modifies, revokes, waives, or suspends a published executive order or similar Presidential directive that carries the force of law and binds the Executive Branch. The legislation responds to a legal opinion of the Department of Justice’s Office of Legal Counsel which concludes that a President can modify or waive an executive order without public notice, simply by not following it. This legal conclusion by OLC was made public in December 2007 through the efforts of Whitehouse and examined at an April 30th hearing of the Senate Judiciary Committee Constitution Subcommittee on the subject of “Secret Law” chaired by Feingold. Back during Michael Mukasey’s confirmation hearings, Sheldon Whitehouse got Michael Mukasey to commit that, when a President changes an executive order, he appropriately should actually change the executive order–so schmoes like you and I can know what the President is actually doing. 2. Do you believe that the President may act contrary to a valid executive order? In the event he does, need he amend the executive order or provide any notice that he is acting contrary to the executive order? ANSWER: Executive orders reflect the directives of the President. Should an executive order apply to the President and he determines that the order should be modified, the appropriate course would be for him to issue a new order or to amend the prior order. A few months later, we learned why Whitehouse had asked Mukasey the question–because Bush was claiming that he didn’t need to change his own executive orders, specifically EO 12333–which Americans would have believed protected them against wiretapping when they were overseas. Let’s start with number one. Bear in mind that the so-called Protect America Act that was stampeded through this great body in August provides no – zero – statutory protections for Americans traveling abroad from government wiretapping. None if you’re a businesswoman traveling on business overseas, none if you’re a father taking the kids to the Caribbean, none if you’re visiting uncles or aunts in Italy or Ireland, none even if you’re a soldier in the uniform of the United States posted overseas. The Bush Administration provided in that hastily-passed law no statutory restrictions on their ability to wiretap you at will, to tap your cell phone, your e-mail, whatever. The only restriction is an executive order called 12333, which limits executive branch surveillance to Americans who the Attorney General determines to be agents of a foreign power. That’s what the executive order says. But what does this administration say about executive orders? An executive order cannot limit a President. There is no constitutional requirement for a President to issue a new executive order whenever he wishes to depart from the terms of a previous executive order. Rather than violate an executive order, the President has instead modified or waived it. After significant efforts, Senator Whitehouse has finally gotten the Administration to declassify the fourth of the four outrageous opinions John Yoo wrote to justify the warrantless wiretap program (the other three Pixie Dust provisions basically allow the President to write his own laws). This one pertains to the exclusivity provision of FISA, which states clearly that FISA was the "exclusive means by which electronic surveillance … and the interception of domestic wire, oral and electronic communications may be conducted." Unless Congress made a clear statement in the Foreign Intelligence Surveillance Act that it sought to restrict presidential authority to conduct warrantless searches in the national security area — which it has not — then the statute must be construed to avoid [such] a reading. The general proposition (of which the November 2001 statement is a particular example) that statutes will be interpreted whenever reasonably possible not to conflict with the President’s constitutional authorities is unremarkable and fully consistent with the longstanding precedents of OLC, issued under Administrations of both parties. A number of you have pointed to smintheus’ excellent post on Bush’s new classification, Controlled Unclassified Information. On Friday afternoon, with George Bush in Texas for his daughter’s wedding, the White House finally released its new Executive Branch rules for designating and disseminating what used to be known as "sensitive" information. The most common term in the past for such material has been "Sensitive But Unclassified" (SBU), though there was an alphabet soup of competing classifications in various agencies. In part, the new rules create a uniform standard across the Executive by replacing SBU etc. with a new classification, "Controlled Unclassified Information" (CUI). The Friday memo states that its purpose "is to standardize practices and thereby improve the sharing of information, not to classify or declassify new or additional information." The initial impetus for change came in a December 2005 memo in which Bush called for a new policy for information sharing between agencies. The alphabet soup of "sensitive" designations too often played into the hands of officials who sought to hoard information rather than to share it. Though the material to be regulated is nominally "unclassified", this new system is in fact a much more sweeping program for keeping information secret than the ostensibly higher grades of secrecy for "classified" material. And at the same time, the system for designating "unclassified" information is in significant ways far less regulated than for "classified" information. This new memo represents the opposite of reform. I agree with smintheus that this classification is simply an invitation for bureaucratic games that result in less information sharing rather than more. But at the same time, with the increasing evidence that it doesn’t matter what Bush says the classification guidelines are, key players in his Administration will just do as they please anyway, I’m not sure the CUI is the worst of our worries. To learn that such a document was classified had the same effect on me as waking up one morning and learning that after all these years, there is a "secret" Article to the Constitution that the American people do not even know about.